Voces de la Frontera began as a newspaper in Austin, Texas founded in 1994. The newspaper, co-founded by Christine Neumann-Ortiz, was affiliated with the Coalition for Justice in the Maquiladoras, an organization advocating for the rights of workers in the multinational factories in the North American Free Trade Agreement (NAFTA)-created free trade zones close to the border on the Mexican side. The paper championed immigrant rights, the rights of maquiladora workers, and promoted solidarity between workers in the US, Mexico, and Canada. Voces de la Frontera’s name in Spanish means “Voices from the border” and is a reference to the voices of workers in the maquiladora industry organizing for safe and dignified conditions along the US-Mexico border. In 1998, both Christine and the newspaper relocated to Wisconsin. While maintaining ties to the Coalition for Justice in the Maquiladoras, Voces de la Frontera reoriented it’s organizing efforts locally to address the other side of the coin to the free trade agreements: the increased forced migration of working people from Mexico and other parts of the world to the United States. Inspired by the workers’ in the maquiladora industry Christine and other local activists opened a Voces worker center in Milwaukee to create a space for immigrant workers to learn about their rights in the workplace and to promote collective action against workplace injustices and for larger government policy changes, such as passage of immigration reform. 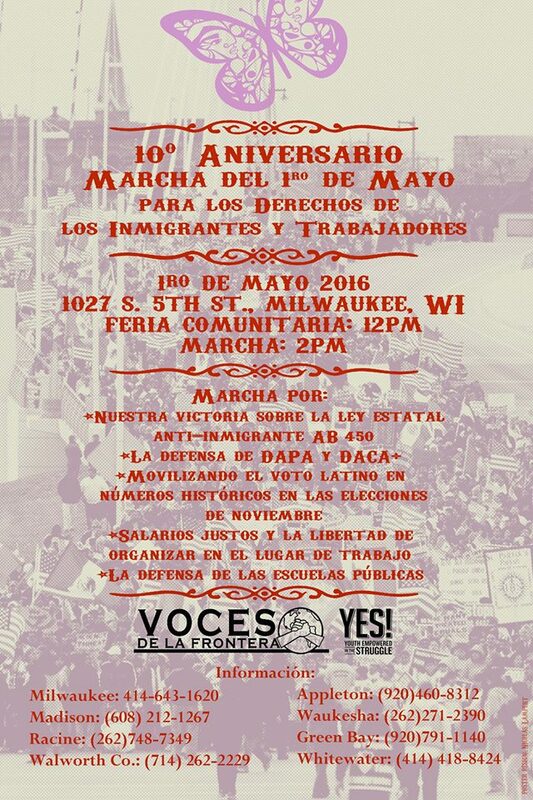 Voces de la Frontera’s Milwaukee workers’ center opened its doors in 2001 and was initially run by volunteers. Voces de la Frontera helped co-found with other immigrant rights organizations and the Center for Community Change, a national network of immigrant rights organization in 2000 in what is now known as the Fair Immigration Reform Movement (FIRM). This early period grew the base of the organization by engaging hundreds of workers in a series of fights to protect workers against employer and government efforts to use Social Security No Match Letters or other forms of re-verification-as a way to “raid” the workplace to drive workers into even more exploitative work conditions, or as a means of retaliation or discrimination. The organization in these early years developed many strong leaders, gained the trust of many workers, and saved the livelihood of thousands of workers across many industries. In addition, Voces as a worker center, played a critical role in re-shaping the local labor union movement by connecting immigrant workers in workplaces that had union representation to make the union leadership aware of immigrant worker’s needs, translated in most cases, and educated local union leaders on how to best advocate for immigrant workers on re-verification issues. Voces had the impact of encouraging local unions to hire bilingual staff, advocated with immigrant workers for better representation, and supported or led some labor union organizing efforts in industries, including asbestos removal in construction, a foundry, and two manufacturing companies one that produced paper products and the other medical products. Voces continued publishing the paper, which steadily helped build the emerging immigrant rights movement. 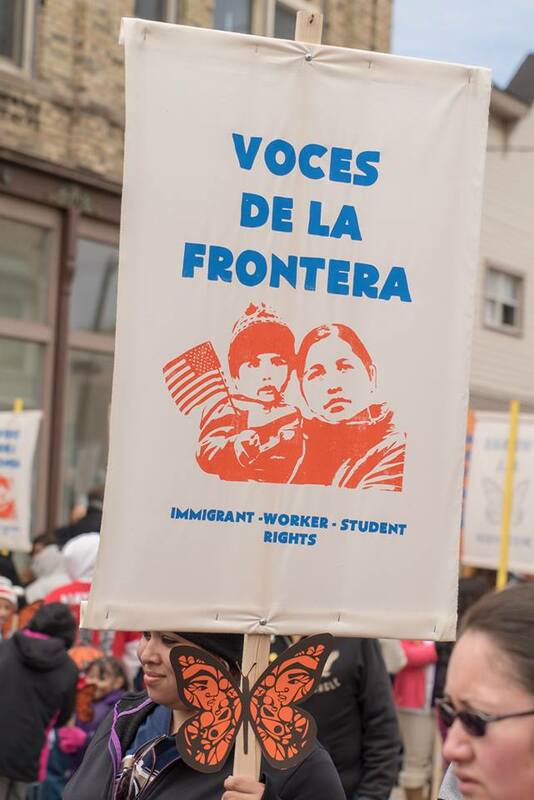 Voces grew significantly in its early years with the opening of an additional office in Racine and the formation a student arm, Students United for Immigrant Rights (SUFRIR) in 2003. In 2004, Voces members founded a 501c4 arm, Voces de la Frontera Action, in order to mobilize voters to elect pro-immigrant candidates. Voces de la Frontera Action registered 10,000 voters in the 2004 elections. Voces gained expanded funding and was able to hire staff, with Christine becoming the organization’s first Executive Director in 2005. Throughout 2005 and 2006, Voces also organized against state legislation to take away driver licenses from undocumented Wisconsin residents. This legislation was inspired by Wisconsin Congressman Jim Sensenbrenner’s 2005 federal REAL ID legislation, which strongly pressured states to take away driver licenses from undocumented immigrants. Although Voces mobilized thousands of people for protests at the Capitol, the bill passed and was signed by Democratic Governor Jim Doyle. Since January 2007, undocumented Wisconsinites have been unable to apply for driver licenses. Thousands of Wisconsin families have been ripped apart after a family member was stopped for driving without a license and detained by Immigration and Customs Enforcement (ICE). Voces has waged strong campaigns to restore access to driver cards for Wisconsin immigrant families. In 2006, Voces organized three massive mobilizations against Wisconsin Congressman Jim Sensenbrenner’s bill HR 4437, which would have made being undocumented a felony and criminalized anyone who did not report someone they knew was undocumented to ICE authorities. Wisconsin’s actions were part of a nationwide wave of mass marches led by immigrant community members against the Sensenbrenner bill, and in favor of humane immigration reform with a path to citizenship. In Wisconsin, an estimated 30,000 took to the streets on March 23rd, more than 70,000 mobilized for ‘A Day without Latinos & Immigrants’ on May 1st, and 25,000 joined the Milwaukee Labor Day Parade on September 4th. The bill was defeated, and this groundswell of nationwide protest is widely viewed as the birth of the modern immigrant rights movement. In 2007, as the fight for comprehensive immigration reform continued, over 60,000 people from across Wisconsin marched for a second ‘Day Without Latinos’ – at that time the state’s largest ever demonstration. More than 120 local businesses closed in solidarity. After the 2007 immigration reform bill was defeated in Congress that Summer, immigrant communities faced an increasingly harsh climate, including stepped up raids and a new attack — ‘No Match’ letters, which alerted employers to undocumented workers on the payroll, and which the Bush Administration started sending to employers to urge them. Voces de la Frontera was one of the leading national organizations in mobilizing against No Match letters, and as part of a national effort successfully pressured the Bush Administration stopped sending them in Fall 2007. In this atmosphere of increased repression and ICE raids, Voces’ immigrant leaders called on the organization to better support families facing the tragic deportation of a loved one beyond a legal referral. Immigrant leaders and faith community supporters of Voces decided to form the New Sanctuary Movement, the faith-based organizing program of Voces de la Frontera. Inspired by the example of Elvira Arellano in Chicago to resist her deportation, the New Sanctuary Movement connected immigrant leaders with various faith institutions, to build resistance to deportations and offer support and physical sanctuary to families facing separation. The Voces New Sanctuary Movement connects immigrants and family members facing deportation to legal resources, helps families find detained loved ones, runs a court accompaniment program, organizes Know Your Rights and organizing workshops, the Círculo de Apoyo support group, and has held monthly prayer vigils at Milwaukee’s ICE office since 2007. The NSM identifies and develops Voces leaders to be liaisons in their faith institutions spread the word about important campaigns and events. During the 2008 elections, Voces launched a massive registration drive to increase the Latino turnout in Milwaukee and Racine. Voces registered over 2,000 new voters, and an impressive 70% of eligible voters voted in Voces’ targeted districts. Milwaukee’s 2008 May 1st demonstrations were again the largest in the country, and demanded the next President pass immigration reform legislation in the first 100 days. The New American program was later created to help Lawful Permanent Residents to become naturalized US citizens in order to petition their family members and build immigrant voting power. The program has a nearly 100% success rate and by mostly word of mouth recruitment brings people from all over the state. 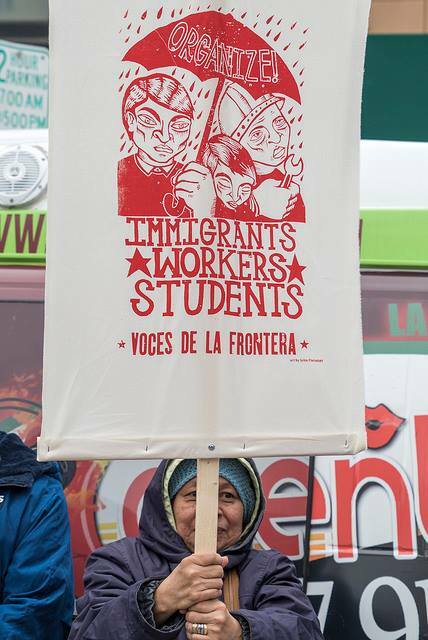 In 2009, Voces and SUFRIR’s statewide organizing campaign won in-state tuition at public colleges for Wisconsin immigrant students, making Wisconsin the 11th state to do so. This was one of the most important pro-immigrant state level victories in the country that year. Voces also built new alliances statewide with diverse constituencies like dairy farmers and law enforcement to support restoring access to driver licenses for Wisconsin immigrants. Although Voces built strong bipartisan support for the bill, the legislation failed to pass out of a Senate committee by one vote. In February 2010, SUFRIR formally merged with the Racine-based Black student organization Students United in the Struggle (SUITS). Together the groups formed Youth Empowered in the Struggle (YES), and remained the student arm of Voces de la Frontera. YES fights for fully funded public schools, for dignity for Black and Brown students, and for immigrant, worker, and student rights. In 2011, over 1000 students from across the state worked with YES to develop a Student Bill of Rights, which was unanimously approved by the Milwaukee School Board and was first incorporated in the Milwaukee Public Schools handbook during the 2012-2013 school year. Additionally, when Scott Walker eliminated in-state college tuition for immigrant students as part of Act 10, delegations from YES and Voces met with the university officials across the state to urge them to find a way to continue providing in-state tuition to undocumented Wisconsin students. UW-Milwaukee agreed to do so, and other technical colleges and universities have followed suit. Voces organized a civil disobedience action at the state capitol during the joint finance committee hearings to protest the repeal of tuition rights for Wisconsin immigrant youth. As the three week uprising against Act 10 swept the state in February and March of 2010, Voces organized daily buses from the south side to the Capitol to join the hundreds of thousands protesting Walker’s assault on worker rights. That year’s May Day Solidarity March for Immigrant and Worker Rights drew 100,000 people to the streets of Milwaukee. The AFL-CIO joined the march to show continued resistance to Act 10 and show labor’s support for immigration reform. Since Palermo’s Pizza opened their Menomonee Valley factory in 2006, workers had sought assistance from Voces related to disputes with management over unsafe working conditions, low wages, and seven-day work weeks. Under pressure to speed up production, at least three workers lost fingers in machinery from 2008 through 2013. In 2011, Voces met with workers and decided to support their efforts to form a union to address long-standing problems that needed a collective agreement to force the company to have better standards on how they treated their employees. The vast majority of Palermo’s workers were immigrants, many undocumented, and the company sought to use the full weight of immigration law against the workers’ effort to better their conditions. The company, aware of the workers’ organizing efforts, started to display anti-organizing literature in the workplace. The workers heard a rumor that an ICE audit was being conducted and in less than 48 hours collected and presented to management a petition signed by three quarters of the workers demanding recognition of the Palermo Workers on May 29, 2012. The next day, management sent letters to 89 workers demanding they re-verify their immigration status within 10 days or be fired. The timing of management’s reverification demand was suspect. ICE had launched an audit of the company in February 2011, and finally sent a letter on May 10th to Palermo saying that 89 employees needed to reverify their immigration within 30 days. Management told the workers they had 10 days to reverify their status or be fired. Recognizing that Palermo was seeking to use immigration law to break the union drive, over 100 workers went on strike on June 1st. Voces partnered with the AFL-CIO Organizing Department and the United Steel Workers to support the organizing efforts of workers to win recognition of the Palermo Workers Union. After demonstrating evidence of organizing, ICE-in the first case ever-said they would halt their audit in recognition of the existing labor conflict. However, the Palermo owners & management fired the workers, who had made the company so prosperous, using the ICE audit to retaliate against their organizing effort. The Palermo struggle became a national test case for the strength of national labor law to prevent employers from using immigration law to undermine labor law. Voces and the workers sued, alleging that the firings were retaliation for the workers’ support for the union, but in November 2012, the NLRB upheld the firings of all but 11 of the workers. While the NLRB acknowledged there were labor violations, the law failed to restore their rights to be rehired and to vote in a union election. Inter-union struggles also contributed to weakening the union election process and a boycott campaign of Palermo to use economic leverage to get the company to negotiate. It was a clear example of an employer using discriminatory immigration law to stop workers from coming together to fight for better conditions, and to keep wages low across all industries. The struggle made meaningful progress by being the first major labor struggle in the wake of the repeal of Act 10 in Wisconsin that highlighted the need for unions, built greater solidarity among union members and immigrant workers, forced the company to raise wages and make health and safety improvements, and set important legal precedents with ICE and OSHA. Palermo was forced to address dangerous handling of chemicals in the plant that had the potential to create an explosion with a six-mile radius. In 2012, as Mitt Romney ran on an anti-immigrant platform of “Arizonafication” and “self-deportation,” Voces de la Frontera again mobilized the vote to re-elect Obama. Voces was part of the national effort in the lead up to the elections, to put pressure on the Obama Administration to stop escalated deportations and resulted in passage of Deferred Action for Childhood Arrivals (DACA). After Walker and Wisconsin Republicans passed Voter ID legislation and a sweeping gerrymander to disenfranchise Black and Latino voters, Voces filed two federal lawsuits seeking to protect voting rights. Although a federal judge initially blocked the voter ID bill, it was ultimately allowed to become law. Several Wisconsin Republican leaders credited voter ID for Trump’s 2016 victory in the state. Voces’ suit against the 2011 gerrymander was more successful. In March 2012, a three-judge federal panel ordered the maps as drawn by Voces’ expert witness, and these maps have remained in place. 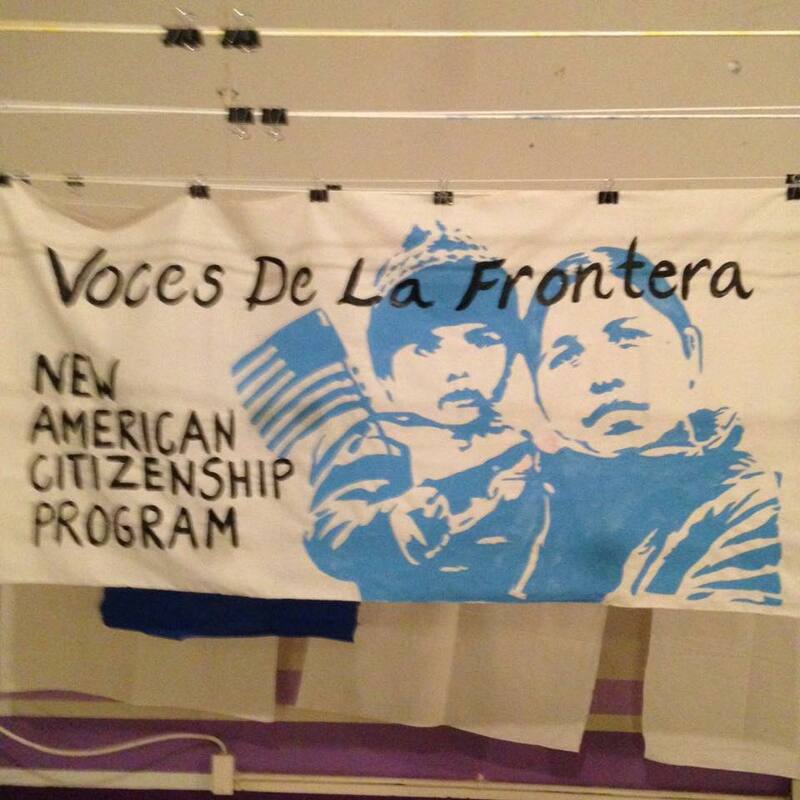 In recognition for its invaluable contributions to the immigrant rights movement, The Nation named Voces de la Frontera the “Most Valuable Grassroots Organization” in the country for 2012. In 2013, as Congress debated comprehensive immigration reform legislation, Voces members lobbied all 8 Congressional representatives in Wisconsin and both Senators to demand a bill be passed that prioritized a broad path to citizenship, protected worker rights, and stopped deportations. The Senate passed the comprehensive bill, but Speaker Boehner refused to bring the bill up for a vote in the House. In 2013 and 2014, the steady drumbeat of criticism from the immigrant rights movement against President Obama’s disastrous increase in deportations and the separation of families became a full-fledged roar. Voces began launching online petitions to demand the release of detained community members, which helped some people detained by ICE win release. After Obama surpassed 2 million deportations in Winter 2014, Voces organized a Shutdown ICE at the Milwaukee ICE office. Voces members chained themselves together and blocked the building’s garages, stopping ICE deportation vans from leaving to carry out raids for several hours. Voces successfully organized with the national ACLU to stop a trend of ICE raids in and around court rooms. In response to this organizing, in November President Obama announced the Deferred Action for Parents of Americans program (DAPA), which would protect the parents of US Citizens and Lawful Permanent Residents from deportation. In addition to creating national standards in county jails that required a judge’s warrant to share information or hold any person for ICE beyond their release. Disgracefully, 26 Republican-led states including Wisconsin filed a lawsuit which ultimately blocked the DAPA program. At the same time, Voces was expanding organizing to break the links between local law enforcement and ICE that lead to deportations. In 2012, Voces had won a resolution passed by the Milwaukee County Board of Supervisors that sought to limit when the Sheriff’s Office would comply with unconstitutional ICE detainer requests. Milwaukee County’s then-Sheriff, the right wing extremist David Clarke, had ignored the resolution. Voces continued organizing against the use of detainer requests to separate Milwaukee immigrant families, and as part of those efforts, filed an open records lawsuit in 2015 against Clarke to demand he turn over information about the hundreds of people his deputies were handing over to ICE. Voces won the lawsuit in the circuit court and at the appeals level, but the Wisconsin Supreme Court, dominated by far right Republicans, sided with Clarke, in a clear favor for a political friend. Clarke had actually campaigned for one of the justices, Rebecca Bradley, but she refused to recuse herself. The lack of driver licenses for Wisconsin immigrant residents had meant that tens of thousands of people had no way to obtain identification. This need led Voces to push for Milwaukee to create a local ID card available to city residents regardless of immigration status. 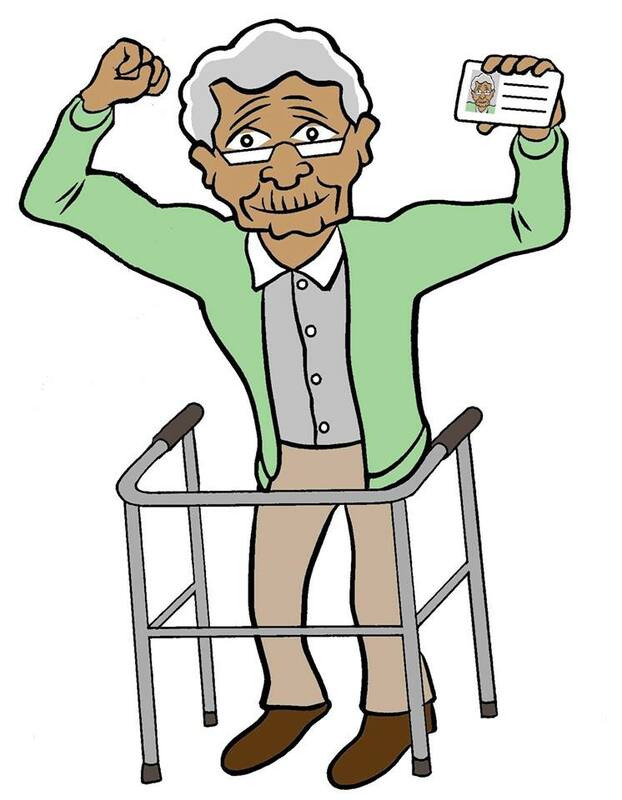 In 2015, Voces organized the We Are All Milwaukee Coalition to push for the creation of a local ID card. The coalition included immigrant rights groups, transgender and LGBT advocates, ex-incarcerated people’s organizations, and groups serving people experiencing homelessness, all constituencies that disproportionately lack ID. The City of Milwaukee and Milwaukee County passed legislation to create an innovative joint ID card program in Fall 2015, but, as they had done after Milwaukee County passed other progressive legislation, anti-immigrant Republicans in the Wisconsin State legislature advanced a bill to stop the county from participating in the program. At the same time, Republicans introduced a bill to ban so-called sanctuary cities by stopping local governments and law enforcement agencies from passing policies restricting when employees could question people about their investigation status or hand people over to ICE. The bill aimed to turn public employees and local law enforcement into an arm of the mass deportation machine. Voces organized a series of lobby days against the bill, and hundreds of community members packed every committee hearing and vote to show opposition. Despite the popular mobilization, Republicans indicated they were intent on passing the legislation. Voces organizers and members realized that only a Day without Immigrants general strike could defeat the bill, as in 2006. Taking up the recommendation of the Voces board, Voces members in chapter meetings in Madison and Milwaukee unanimously voted to call for a statewide Day without Latinx & Immigrants and mobilization on the Capitol in Madison on February 18th. Workers throughout the state began to make plans with coworkers to strike and go to Madison on the 18th. Voces coordinated participation from over 40 cities. Hundreds of businesses announced plans to close. Voces organizers supported workers in drafting letters to present to employers explaining the urgency of the strike and the threat the anti-sanctuary bill posed to their livelihoods and families. As in 2006 and 2007, Voces supported workers to organize themselves collectively to prevent retaliation. The participation cut across all industries: fast food, factories, cleaning, hotels, restaurants, including Wisconsin’s signature industry, dairy. Through Spanish language media, through flyering at churches and community spaces, and through word of mouth, the call for the strike spread. Analysts estimate that over 80% of the workers who directly milk the cows in Wisconsin’s dairy industry are immigrants. Thousands of dairy workers made clear they would participate in the strike, and so on February 16th, dairy worker leaders, Voces organizers, radio DJs whose audience was dairy workers, and representatives from the Dairy Business Association (DBA) met and agreed that for most farms, a delegation of workers would travel to Madison while a skeleton crew remained to milk the cows. If cows are not milked on a very tight schedule, often multiple times per day, they can quickly sicken and die. Without immigrant workers, the state’s signature industry would collapse in a matter of hours. In exchange, the DBA would formally register against the bill and directly lobby Republican legislators and Governor Walker to stop it. Most DBA members are Republicans, and the association is influential in Wisconsin’s Republican Party. Prior to this, the DBA had refused to take a position on the legislation. The day after the meeting, the Assembly passed the anti-sanctuary bill, but the Senate still had to pass it before it could become law. The day of the strike, workers, poured into Madison. Police and press estimated 20,000 protesters mobilized on the Capitol, while organizers estimated 40,000. Hundreds of businesses closed, and thousands more were affected by work stoppages and mass worker absence. Univision reported that the dairy industry operated at 50% capacity that day. It was the largest protest in Wisconsin since the Act 10 uprising, and it had a broader economic impact than perhaps any labor action in the state’s history. Tens of thousands of students were absent from schools in Milwaukee and Madison. Led by Voces student leaders, thousands of Madison high school students walked out and marched to the Capitol. The next day, Scott Walker and Republican Majority Leader Scott Fitzgerald announced the anti-sanctuary bill would not be voted on in the Senate. Voces appeared to have won. 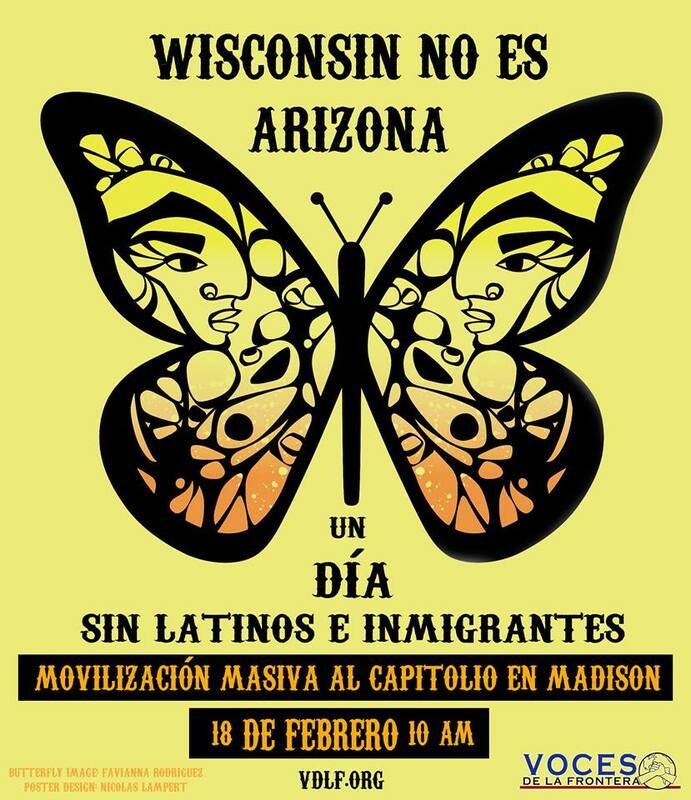 Voces organized a statewide day of action in early March and announced that year’s May Day march would call for Walker to definitively stop the anti-sanctuary bill and the anti-ID card bill, but on March 16th, the Senate adjourned without voting on the bill. This was an historic victory for the immigrant rights movement, and one of the most important state level victories in 2016. The Nation again named Voces to its Progressive Honor Roll, this time recognizing Voces for “Most Valuable Strategy” of 2016 for the Day without Latinx & Immigrants. Voces looked to consolidate the statewide network that had grown in the fight against the bill. Immigrant leaders formed official Voces chapters in Madison, Green Bay, Walworth County, Manitowoc, and Sheboygan. Since then, Voces has formed additional formal chapters in West Bend, Kenosha, and Waukesha. In response to Voces’ organizing, the Milwaukee Common Council created a local ID card available to all residents of the city, and which more than 5,000 residents have obtained as of this writing. Voces’ chapters then turned to focus on the 2016 elections and stopping Trump. Mobilizing voters was difficult in the run-up to the 2016 elections. Although movement pressure pushed Clinton to commit to progressive positions like expanding deferred action to stop deportations, working class voters widely identified her with the most conservative and disappointing aspects of Obama’s time in office — expanded free trade at workers’ expense, lower wages, rising inequality, the flawed and incomplete aspects of Obamacare, the continued expansion of mass incarceration, and the almost 3 million deportations. In addition, conservatives had blocked the implementation of DAPA which would have re-enegized the base of Latinx voters by providing meaningful change. In the days after the election, Voces held mass meetings statewide asking the community to provide input and vote on a mass resistance plan to Trump’s white nationalist agenda. Participants voted to fight deportations, document abuses, provide legal resources, educate the community about their rights, organize religious congregations to provide physical sanctuary, pass pro-sanctuary policies and resist attacks at the local, state, and federal level. In light of the 2016 Day without Latinos and Immigrants general strike, workers at the forums voted to use the general strike as a key tool of resistance to the new administration. 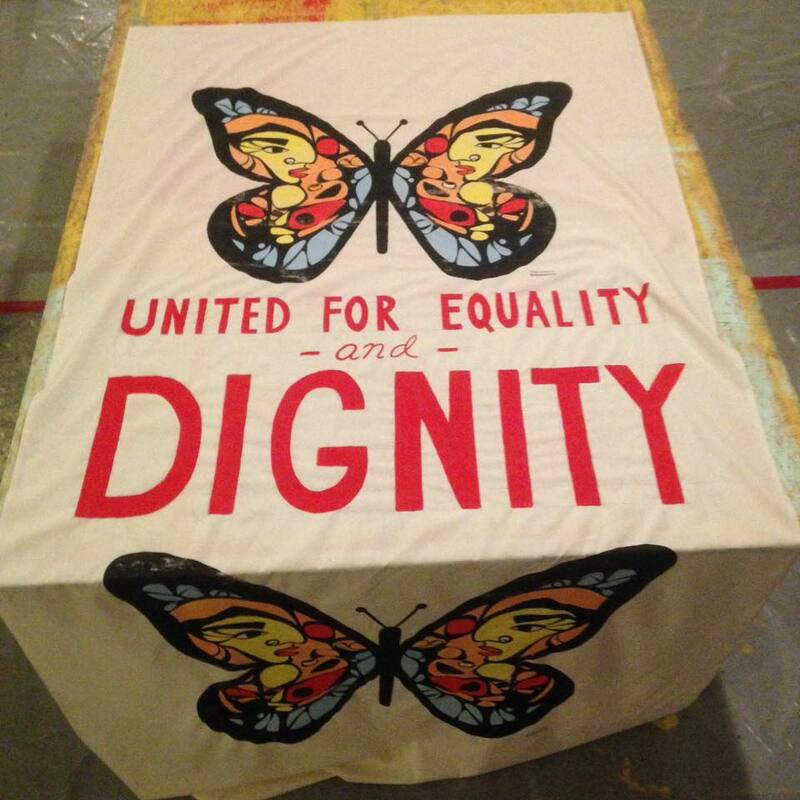 Through Voces’ faith-based arm, the New Sanctuary Movement, congregations committed to offer physical sanctuary to immigrant families facing deportation. 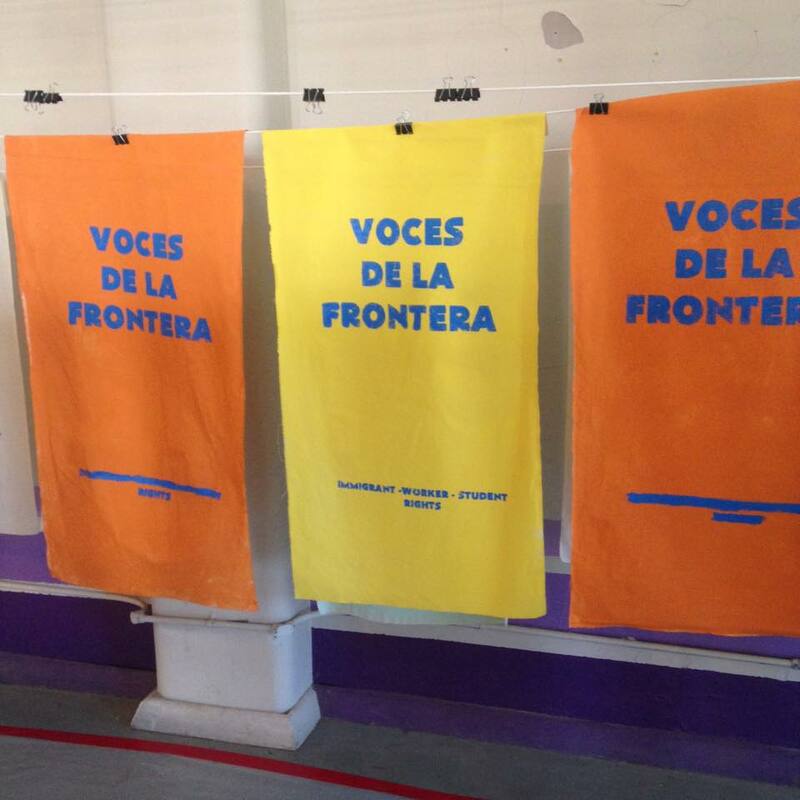 Artists who had been working with Voces on an ad hoc basis for years decided to formally create Voces de los Artistas, an artists’ committee to create art and designs for movement campaigns. In January 2017, Milwaukee County became the front line in the fight against Trump’s efforts to turn local law enforcement into an arm of his campaign of terror against immigrant families. Milwaukee County Sheriff David Clarke declared he would seek authorization under the 287g program to turn his deputies into immigration agents. 287g is a discredited program that promotes discrimination, breaks up families, and undermines public safety. It’s a key part of Trump’s infrastructure for mass deportation. Only massive resistance could stop Clarke. As in 2016, Voces called a community meeting and called a Day without Latinx Immigrants, and Refugees general strike for February 13th to show the broad opposition to Clarke and his bigoted agenda. The day of the strike over 120 businesses closed, and over 50,000 people marched on the Milwaukee County Courthouse. Inspired by Wisconsin’s example, immigrant community members on social media from around the country called for a nationwide Day without Immigrants for February 16th. The people pushing for this were unaffiliated with any established organizations. Clarke remained defiant, but Voces kept organizing. 38 Wisconsin sheriffs and chiefs of police spoke out in opposition to 287g, and Milwaukee public officials at every level declared their opposition to Clarke’s application. Voces reached out to elected officials and victims of human rights abuses carried out by Clarke’s Sheriff’s department, including Black Lives Matter organizers slandered by Clarke, mothers who were shackled while giving birth, and families whose loved ones had died in the jail. Voces called for Clarke to resign or be removed to face criminal charges himself. Voces circulated a petition that was quickly signed by over 10,000 people urging Governor Walker to use his legal authority to remove Clarke from office. Walker shamefully shirked his responsibility, and said that, despite the Clarke’s abuse of power, his outrageous and discriminatory comments, and the sexual assault and even deaths that occurred on his watch, it was not his job to remove Clarke. As Walker and Clarke refused to budge, Voces planned another general strike on May 1st, but this time at a national scale. In partnership with the National Day Laborer Organizing Network and the Fair Immigration Reform Movement, Voces de la Frontera hosted a national convening of representatives of 38 immigrant rights organizations, worker centers, and national networks in Paul Ryan’s district, to learn from the experience of Voces members and share best practices to organize a national general strike on May 1st. Voces’ efforts made May Day 2017 the largest nationwide immigrant rights mobilization in at least 10 years. It was the third time since 2006 that nationwide, immigrant workers, students and business owners went on strike in large numbers. Milwaukee again led the way. On May Day in Milwaukee, over 30,000 people marched and over 150 businesses closed statewide. Marchers were addressed by Melissa Hall, who was shackled by Clarke’s deputies during childbirth, and the lawyer for Terrill Thomas, who died of dehydration after Clarke’s guards refused to give him water. Following these enormous mobilizations, Clarke knew there was tremendous momentum to defeat him in 2018. He was looking for a way out, and in late May, he thought he had found one. He announced on right wing radio that he would resign from his position to work for the Department of Homeland Security, which oversees ICE. Voces started a petition that was quickly signed by over 20,000 people saying Clarke must not be appointed. Amid massive negative attention, the appointment never happened. Clarke was humiliated and rejected from the national spotlight, but unfortunately, he was still in Milwaukee. With the newly formed Coalition for a People’s Sheriff, Voces continued to demand that Walker remove Clarke and appoint a sheriff who would rescind the 287g application, reject unconstitutional ICE detainer requests, stop the abuses and deaths, and work for the end of mass incarceration. Clarke saw the writing on the wall. He knew there was no way he could win re-election, and he likely faced pressure from other Republicans fearful that he would energize voters to turn out in 2018. On August 31st, he resigned, effective that very night. But that was not the last victory over Clarke. On November 15th, the Department of Homeland Security rejected Clarke’s 287g application. Voces’ efforts to give voice to the victims of David Clarke’s reign of terror ran him out of office, and now his 287g application was defeated as well. The victory over Sheriff Clarke and over 287g in Milwaukee County was one of the most important achievements of the Trump resistance movement in 2017. At the same time, Voces discovered that Waukesha County Sheriff Eric Severson had secretly applied for 287g, despite publicly saying he would not. His application was accepted. Since then Voces has organized protests and mass meetings attended by thousands of people in Waukesha, and opened an office there. On May 1st, 2018, Voces called for a statewide Day without Latinx & Immigrants general strike and march in Waukesha against Severson’s 287g application. Over 10,000 people marched and over 100 businesses closed. Severson implemented 287g and formally deputized some of his officers as de facto ICE agents in July 2018. Voces’ Waukesha chapter is organizing regular Know Your Rights workshop, documenting abuses, mobilizing voters, and organizing local leadership bodies to express opposition to Severson and 287g. In the second half of 2018, Voces de la Frontera Action worked hard to elect a Sheriff who would totally reject 287g, stop the practice of handing people over to ICE through unconstitutional ICE detainer requests, and bring an end to the David Clarke era. ICE has used detainer requests to separate thousands of Milwaukee immigrant families. Earnell Lucas initially announced his candidacy against Clarke in 2017. After Clarke resigned, his longtime chief deputy announced he would run. Voces de la Frontera continued to work with allied organizations in the Coalition for a People’s Sheriff, borne out of the struggle against 287g, to demand reforms to the Sheriff Department. Lucas committed to stop honoring ICE detainer requests while his opponent refused to make that commitment. Lucas additionally affirmed his general support for the Black Lives Matter movement and spoke forcefully in favor of reforms in the department to stop human rights abuses and deaths in the jail. Voces de la Frontera Action played a decisive role in the weeks leading up to the elections in exposing Schmitt’s true record of being complicit with Clarke’s legacy, his own bigoted views on women and the LGBT community, and on immigration. Allied organizations canvassed in the Black community and Voces de la Frontera Action canvassed in Latinx neighborhoods and educated the public as to Lucas’ pro-immigrant positions and his opponent’s true record. Lucas won handily, in a major national victory for the immigrant rights movement and for the movement to end mass incarceration. Voces de la Frontera Action has launched a historic effort called Voceros por el Voto to mobilize 48,000 Latinx voters for the 2018 mid-terms in Wisconsin and elect pro-immigrant, pro-worker candidates up and down the ballot. These efforts will lay the groundwork to grow our base, our alliances and organize post-elections to restore access to driver’s licenses to immigrants and the poor, fully fund public schools, and keep families together.